GeekMedia: The best Tourist Board ad in the World? The best Tourist Board ad in the World? How's that for a view on the way to work? 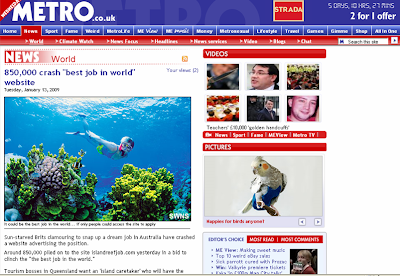 Huge respect to the Queensland Tourist Board, whose job ad for a "Caretaker" for Hamilton Island on the Barrier Reef has so far delivered 850,000 visitors to the recruitment site for the so-called 'Best job in the World'. 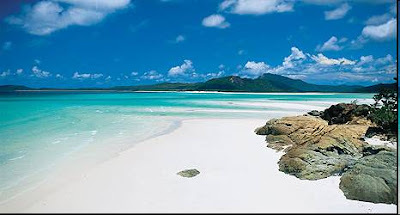 The premise is that the island needs a resident caretaker/publicist, who will need to explore the land and sea over the course of their 6 month contract, and blog, video and generally show off about the fact that this comes with a £70k salary. Applications will be judged on the calibre of writing and video as well as knowledge and general suitability. 10 candidates will be flown out to Queensland to interview. 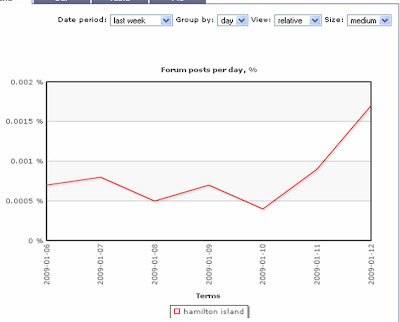 I had a look at the impact this has had on UK interest in Hamilton Island in a few places. 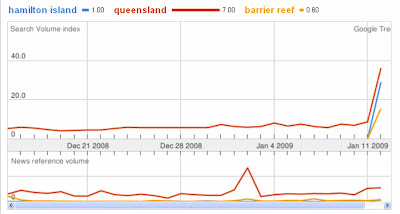 On Google Trends, I looked at the impact on the campaign across searches for Queensland as a whole, the Barrier Reef generally, and Hamilton Island specifically. Although the news volume is not really registering, search volumes show a huge spike for each of the destinations, showing that the campaign is having a halo effect across the whole state. 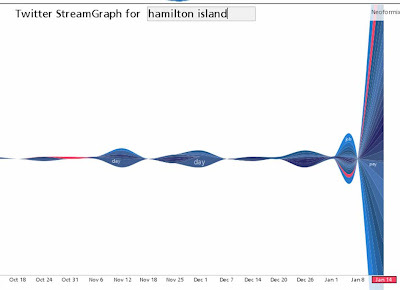 On Twitter, we can use Streamgraph to look at the key sentiments the campaign is generating. Interestingly 'pay' is the key outtake: not sure if this says more about Twitter's 20-40 year old professional user base than about the campaign itself though. Forum posts are showing a similar trend worldwide. 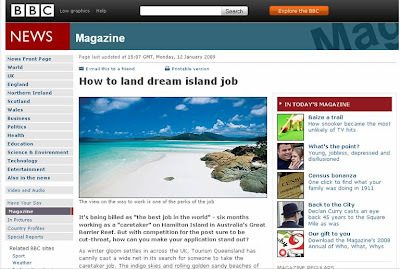 In the time it has taken me to write about this post, I still haven't managed to get the Island Reef Job site working, so assuming that the demand took the QLD web guys by surprise as well. One of the beauties of Addictomatic is that by searching for this campaign alongside web developer terminology is that it took me straight to the team behind it discussing it on Twitter. So great work @xcommedia and @ckjchambers. I have tried every which way to connect to the site, but still not luck. I am going to keep trying though (luckily I can do this non stop anywhere here in Portland on my wireless connection). I wonder if there will be a catch somewhere in the job. It seems too good to be true right now. So how do you like social TV? Get the irata's Bookmarks on Delicious widget and many other great free widgets at Widgetbox!